Medical alert equipment can be life saving and give a person peace of mind, whether for themselves or a loved one. Early intervention can reduce the damage caused to someone from a fall, heart attack, or stroke. In some cases, it can even prevent death. There are many options in medical alert equipment such as electronic life saving bracelets and making the right choice can get a person the help they need when they desperately require it. Medical alert bracelets can give caregivers instant access to valuable medical information. Emergency contact and medical information for the elderly can be placed easily on these life saving devices. Engraved bracelets instantly notify personnel of specific medical conditions, such as drug allergies, immediately when emergency care is necessary. Electronic medical alert bracelets can store life-saving information and medical history. They can be updated quickly and easily. 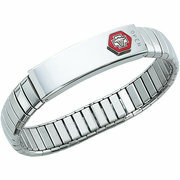 They also hold much more information than a basic engraved bracelet. These electronic bracelets for the elderly and handicapped can be plugged into any computer giving the caregiver accurate information for the patient’s proper care. These can also be emergency bracelets for the handicapped and allow the disabled to live independently. An elderly medical alert system is designed to provide help for people who live alone and are at risk for medical emergencies. They can be life saving for anyone who may face an in-home medical emergency. The medical alert alarm system attaches to an existing phone line. The person simply pushes a button in the event of an emergency. The button is on a water-proof transmitter worn on the neck, wrist, or clipped on a belt. The transmitter then sends a signal to the in-home base unit, which dials a 24-hour monitoring center. The individual will then be able to speak to an operator at the monitoring center, if they are able, without having to go to the phone. The operator then arranges for help, even if the operator is unable to establish contact with the monitored individual. Lifestation offers this medical alert system so you can protect your loved ones. If your main concerns for your elderly parent are if they take their medications on time or if they remembered to turn off the oven, then phone alerts for the elderly service is a perfect choice. The elderly person will get a friendly daily reminder scheduled at the preferred medication time. You can also add on services like a 24 hour live nurse that answers health questions that might concern your loved one. Sign up for this phone or read more about handicap and elderly phones. There are also personal security alarms that the elderly and handicapped can wear around their neck or wrist. Simply press the button and it will dial the proper authorities during emergencies. 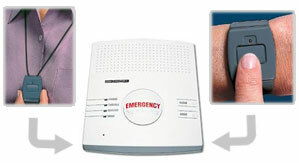 The phone alert system above comes with a wearable bracelet or necklace that you can press in case of an emergency. It will contact anyone you designate as help and easily becomes a life saving device around your neck or wrist. With the use of medical alert equipment, such as medical alert bracelets, phones for the elderly or an elderly medical alert system, a person will feel much more at ease going about their daily lives. They know that help can be right at their fingertips, and caregivers have quick access to their crucial health information. This handicapped equipment gives them the freedom and security to continue to live a life of enjoyment.